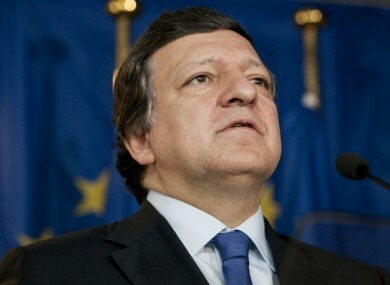 Jose Manuel Barroso erupted in anger after Joe Higgins’ questions about Europe’s position on the Irish bailout. IRISH MEP JOE HIGGINS STRUCK a nerve with Jose Manuel Barroso today when questioning the president of the European Commission over Europe’s involvement in Ireland’s debt. Socialist MEP Joe Higgins challenged Barroso over the Permanent Financial Stability Mechanism, claiming it was “nothing more than another tool to cushion major European banks from the consequences of their reckless speculation on the financial markets”. He claimed the mechanism was forcing European workers to pay for the “crisis of a broken financial system and a crisis-ridden European capitalism”. You claim to be democrats, but you enslave the working people of Europe to the markets – the financial markets – who lead you around by the nose. Europe is now part of the solution, is trying to support Ireland, but it was not Europe that created this fiscal irresponsible situation and this financial irresponsible behaviour. Email “European Commission president turns on Irish MEP over bailout (Video)”. Feedback on “European Commission president turns on Irish MEP over bailout (Video)”.